NEW HAVEN - In a wild one at Yale's Ingalls Rink with standing room only in the building, Matt Wikman scored twice and goalie Matt Beck had 20 saves to give No. 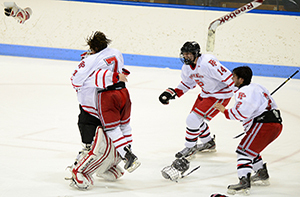 1 seed Fairfield Prep a 3-2 win over No. 2 Notre Dame-West Haven in the CIAC Division I boys' hockey championship on Tuesday. The teams faced each other for the fourth time this season, Prep won the previous three meetings and Notre Dame yearned to make the fourth time the charm. But it wasn't meant to be. 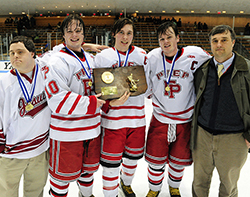 "Beating a team four times in one season on one hand is special, but it's also humbling," Fairfield Prep coach Matt Sather said. "On any given day they could have beaten us. "Winning a title is always special. I thought we started slow today but we've been doing that all during the tournament. Down 2-0, I thought the turning point was the power-play goal we scored (cut the score to 2-1). Our passes were more crisp." The Jesuits (23-1) outshot the Green Knights 12-7 in the first period but it was Notre Dame-West Haven with a 2-1 lead at the first intermission. The Green Knights took a 1-0 lead off a slap shot from defenseman Lou Iannotti. His low rising shot flew past Prep goalie Matt Beck for the 1-0 lead at 7:34. The Green Knights wasted no time increasing the lead when Bill Vizzo wristed a shot from inside the left circle. The puck went off Beck and into the lower right corner for the 2-0 lead at 8:57 of the first period. Enter Wikman to give the Jesuits their first goal on the game's first power-play opportunity. ND's Greg Zullo was called for tripping at 11:14 and at 12:38 Wikman scored off a hard slap shot from the left circle. The puck hit ND goalie Paul Sliwinski's stick, popped up and into the back of the net to cut Notre Dame's lead to 2-1. The Jesuits wasted little time tying the game at 2 in the second period on a pretty play between Mike Ventricelli and Tim Edmonds. On a 2-on-2 breakaway down the right wing, Edmonds sent a pass to Ventricelli in front of the right post. Ventricelli wristed a shot inside the right post for the goal and the 2-2 tie at 3:02 of the second period. Quality goaltending by Beck and ND's Paul Sliwinski allowed the score to stay tied at 2 heading into the deciding third period. Both sides had chances to take the lead in the third period. But it was Wikman who eventually came through for the game-winning goal for the Jesuits. He took a rebound off the right post and wristed it into the net for the 3-2 lead at 8:34 of the third period. "We were concerned being down 2-0, but we just had to pick up the intensity," Wikman said. "It was important to get us going with that first goal but it felt great getting that third goal. When the puck hit the post it came right back to me and I just chipped it in." Sliwinski made 28 saves for Notre Dame (18-6-1) . "This game was special, a heck of a game," Notre Dame-West Haven coach Bill Gerosa said. "Paul was tremendous in goal for us and came up big. But for them to beat us four times, God bless them. The momentum changed after that power-play goal. All our guys played their hearts out and I'm proud of all of them." CIAC Division I Finals Notre Dame timeout with 2:13 left in 3rd period.